Photo of Mahsa Shekarloo by Kamran Ashtary. Used with permission. You can share it with attribution, but don't sell it. 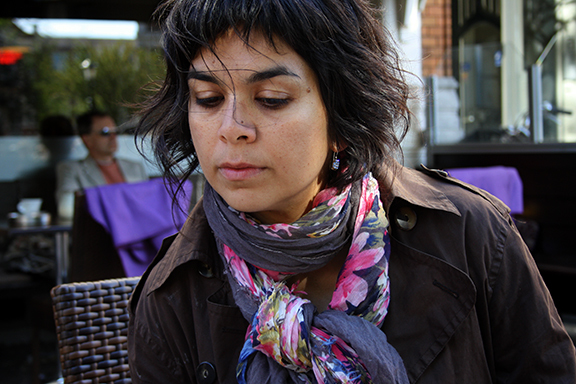 Mahsa Shekarloo, women’s rights activist, writer, editor, translator and founder of the online feminist journal Bad Jens, died Friday September 5, 2014, surrounded by her family. She had been stricken with an aggressive form of cancer. In this post, Tori Egherman from Arseh Sevom, an organisation that promotes openness and human rights in peaceful Persian-speaking communities, joins others around the world in mourning her loss and celebrating her life. Mahsa was thoughtful, skeptical, and insightful. In life she would not have wanted to be the center of so much attention. Her passion and work were not done to fulfill a personal ambition or to place her front and center in the public spotlight. She worked because of her great curiosity, her dedication to human rights and the women’s movement, and her belief in the possibility of change. She was part of a group of people from the Iranian diaspora who returned to Iran to employ their cultural capital and experience and contribute to the culture. She joined a group of Iranian women who were taking advantage of that moment when there was a small opening in the political system to expand the women’s movement and the discussion of equality of men and women in the culture. Mahsa also translated two of Nobel Laureate Shirin Ebadi’s books: Women's Rights in the Islamic Republic of Iran and The Story of One Woman. For us in Iran, One Billion Rising is one more way for diverse social groups to unite and demand justice and equality for women in the home and in society. We take to the streets because they form the fabric of our lives. The streets are our stomping grounds. They hold our memories, pain, and joys. They are where we find our allies and friends and where we become aware of dangers. They are where we take refuge when our homes become unsafe. It is on the streets where we have discovered our voices and also have lost our lives. The streets are where we articulate our demands and where we haggle and negotiate, not just with the merchant, but also with the ruler and sovereign. Stomping in the streets is a way for us to arrive at reconciliation, equality and social justice for all. This action is for those who want joy for themselves and for others, and who are willing to stomp for it. Post by One Billion Rising – Iran. In a 2007 interview with Qantara.de, Mahsa discussed the online feminist journal she founded: Bad Jens. The objective of the journal was to give a voice to feminists inside Iran, to provide a way to break out of the isolation that they felt, and to challenge Western assumptions. …I think most Westerners, when they come to Iran, assume that Iranian women, Muslim women, are among the most oppressed women in the world – which may or may not be true. But the point is that – because they come in with that assumption – everything they see, when they're here, seems to confirm that. And if Westerners do have positive images of Iranian women, they're always represented as these heroines. So it's these two extremes: on the one hand Iranian women are portrayed as very passive and as victims, and one the other they are just an exception, breaking all the rules and social norms. So what gets lost is everything in between. The bi-lingual journal Bad Jens was a revelation for many. At the time of its launching, there were few sources for the English writings of people living and working in Iran. Iranians like Mahsa used the internet to create a public forum denied by restrictive policies on other platforms such as printed magazines and newspapers. The internet was adopted quite early in Iran. It opened a space for challenging governmental doctrine, engaging in debate, and personal expression. The impact of the Internet on Iranian politics resembles the introduction of earlier information technologies, such as the telegraph in the late nineteenth century and the cassette tapes in the 1970s, which also created new individual and social spaces for dissent. The online journal Bad Jens contributed to the discussion with thoughtful articles, fiction, and poetry. You use any available avenues that you have. One reason why the internet is so popular here is precisely for that reason. It's an independent space, relatively accessible or at least relatively uncontrolled. For many working on issues of human rights and women’s rights, Mahsa was a kind of conscience. She believed in the power of small changes beginning with the family and inside small social groups. Positive change could be more sustainable if it took root in the family and was not imposed from outside. She lived her life practicing her ideals in all ways: as a friend, a mother, and a colleague. This is why her loss is such a tragedy for so many of us. What we gained from her comradery was more than she herself knew or could imagine. This is because her work as an engaged intellectual and defender of rights went beyond the professional. She showed many that the effects of living a life dedicated to small, changes could have a broad impact and create lasting change. It should come as no surprise to us that tributes to her are coming in from so many directions and from all over the world. Her sharp intelligence, warmth and generosity of spirit was admired by many. She showed the right mix of skepticism, realism, and optimism when it came to designing projects and taking action. …when she's not helping others help Iranian women, she's secretly sowing post-colonial feminist thought among her unknowing colleagues. Mahsa Shekarloo was an internet pioneer, a women’s rights activist, and a friend. She will be missed. Originally posted on Arseh Sevom.